Ken Griffey Jr. is going into the Hall of Fame as a Seattle Mariner, and Mike Piazza’s plaque will feature a New York Mets hat. Those decisions were largely expected, but a strong case could be made for Griffey with the Cincinnati Reds and Piazza with the Los Angeles Dodgers. There was some controversy this year, but nowhere near the amount that we’ve seen with past decisions. Here are 10 cap calls that still get fan bases riled. Dennis Eckersley: Red Sox or A's? 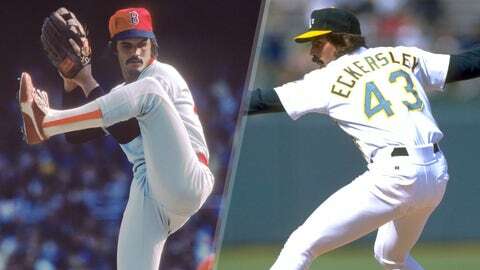 Eckersley’s case was even tougher because he had two distinctly different careers with two different franchises. During his tenure (1978-84) with the Red Sox, Eckersley was primarily a starter, winning 84 games. After he joined the A’s (1987-95), he became a dominant closer and earned his first 320 saves. Eck also pitched for the Cardinals, Cubs and Indians before returning to the Red Sox for his final season in 1998. He earned Hall of Fame induction in his first year of eligibility in 2004 and sports an A’s cap on his plaque. 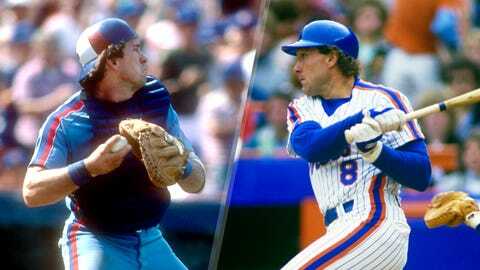 Gary Carter: Expos or Mets? Carter reportedly wavered between the Expos and Mets, but it was the Hall of Fame who ultimately made the call for him when he was inducted in 2003. And the decision was the Expos, with whom he spent the first 11 years and the final year of his career. Carter swatted 220 homers with Montreal, compared to 89 with the Mets, with whom he won the 1986 World Series and played for five seasons. Reggie Jackson: Yankees or A's? Reggie Jackson was a key part of the A's back-to-back-to-back World Series titles in 1972-1974, but he earned his 'Mr. October' moniker during the 1977 World Series for the Yankees. The nickname stuck after he hit his third home run of Game 6, the fourth home run he’d hit in his past four swings off four different Dodgers pitchers. During his career, Jackson amassed 14 All-Star appearances, five World Series wins and two World Series MVP Awards. He had his number retired by the A's and Yankees (No. 9 in Oakland and No. 44 in the Bronx). He entered the Hall in 1993 proudly wearing a Yankees cap, though he played 10 of his 21 years with the A’s. That’s the power of a nickname earned after a superhuman World Series performance. 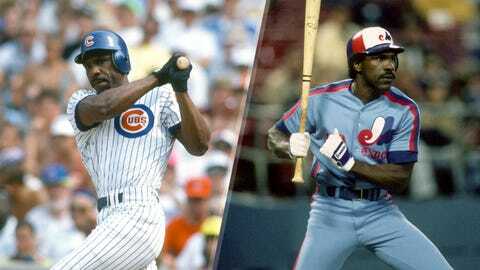 Andre Dawson: Cubs or Expos? Dawson played 11 seasons with the Expos, and six seasons with the Cubs. He expressed a desire to have his Hall of Fame plaque portray him wearing a Cubs hat, but the Hall decided he would don the Expos fleur-de-lis 'M' symbol when he was elected in 2010. While a great player in Montreal, Dawson arguably had his best seasons in Chicago. In all but one of his six seasons with the Cubs, he was an All-Star. He was named NL MVP in his first season in Chicago, hitting 49 home runs and driving in 137 runs in 1987. 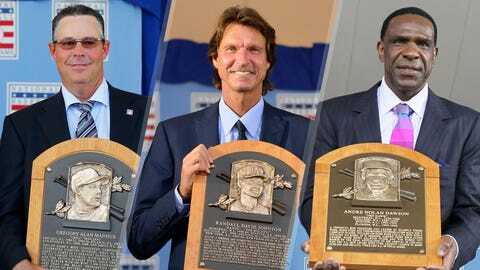 Had Dawson been elected to the Hall of Fame prior to 2001, he would be wearing a Cubs cap on his plaque; by 2010, however, the Hall had final say. When Dawson learned of the Hall of Fame's decision, he stated it was 'gut-wrenching' to hear he wouldn't be enshrined as a Cub. 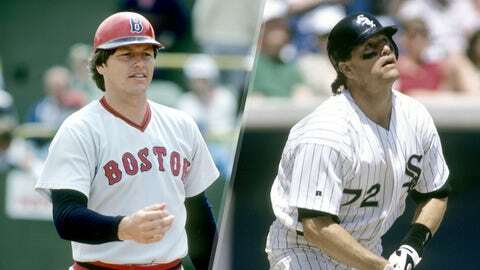 Carlton Fisk: Red Sox or White Sox? Fisk played the last 13 seasons of his career with the White Sox, but his first 11 seasons in the league were with the Red Sox. That likely made the decision for the catcher. When it came time to decide, Fisk said the Boston cap had always been his 'favorite hat' and it has 'always been a part' of him. Of his 11 All-Star Game appearances, seven came as a member of the Red Sox. He also won the AL Rookie of the Year Award with Boston in 1972. Fisk is one of only a handful of players with his number retired by two teams. His No. 72 was retired by the White Sox in 1997, and his No. 27 was retired by the Red Sox in 2000. 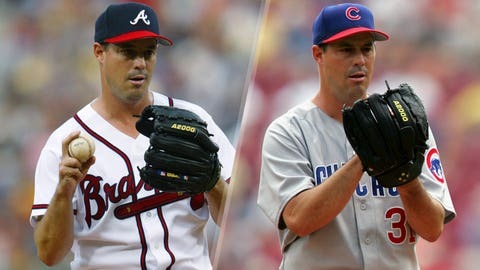 Greg Maddux: Braves or Cubs? Maddux pitched in the big leagues for parts of 23 years and while he was absolutely dominant with the Braves, his more formative years might have been with the Cubs. From 1986 to 1992, Maddux went 95-75 with a 3.35 ERA, 42 complete games and 13 shutouts. It was an incredible start to his career and he cashed in on it, signing a five-year, $28 million deal with the Braves. That's where he took off. In those first five seasons, Maddux went 89-33 with a 2.13 ERA. The Braves gave him a five-year extension worth $57.5 million, making him the highest-paid player in baseball. The success from the Braves and sentiment from the Cubs made choosing a Hall of Fame cap impossible for Maddux. Instead of picking between the two, he went in with no logo on his plaque. 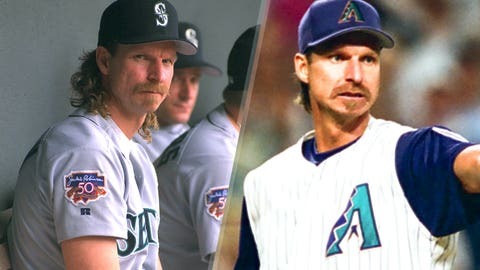 Randy Johnson: Mariners or Diamondbacks? Johnson had a choice of six teams to wear on his hat in the Hall -- but only two teams with more than 67 appearances: the Mariners and Diamondbacks. After a trade from the Expos to the Mariners in 1989, Johnson became one of the most dominant pitchers in franchise history. In his 10 seasons in Seattle, he went 130-74 with a 3.42 ERA, striking out 10.6 hitters per nine innings. After the 1998 season, he signed with the D-backs and blossomed into one of the most dominant pitchers in MLB history, helping boost the franchise to its first World Series title in 2001. From 1999 to 2004, he went 103-49 with a 2.65 ERA, striking out 11.9 hitters per nine; he went 15-13 with a 3.89 ERA in a second stint in Arizona from 2007 to 2008. When the time came, his plaque was the first ever to feature a Diamondbacks logo. 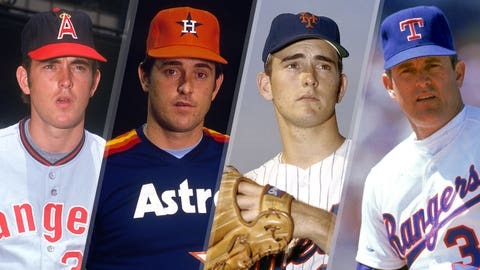 Nolan Ryan: Angels, Astros, Mets or Rangers? Ryan played nine years with the Astros and eight with the Angels, so surely he should be wearing one of those hats on his Hall of Fame plaque, right? That would've seemed the logical choice for the flame-throwing right-hander, but he chose to don a Rangers cap in the Hall, a puzzling decision given that he first pitched for them at age 42. On paper, there are no clear-cut indicators as to why he chose the Rangers over the Mets (with whom he made his debut and won a World Series in 1969), Angels (with whom he led the league in strikeouts on seven different occasions) or Astros (with whom he twice led the league in ERA) other than that he ended his career with the club. Additionally, Ryan, a Texas native, says he grew up an Astros fan. 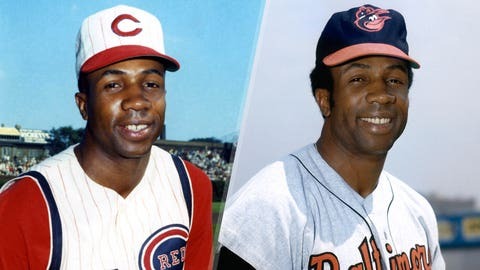 Frank Robinson: Reds or Orioles? Robinson won the NL Rookie of the Year Award with an incredible debut season at age 20 in 1956 with the Reds. He played 10 seasons in Cincinnati, winning the NL MVP Award in 1961. However, when it came time to select which logo would follow him into immortalization in the Hall of Fame, he chose the Orioles, with whom he spent six seasons and won two World Series titles (1966, 1970). While Robinson performed exceptionally well in his decade with the Reds, his tenure with the Orioles commenced with an instantaneous boom of prosperity. In his first season after being traded to Baltimore, he had a career year at the plate, bashing 49 home runs with 122 RBI at a .316/.410/.637 clip. Robinson was voted AL MVP in 1966, but that was only the beginning. Later that season, he was named World Series MVP. 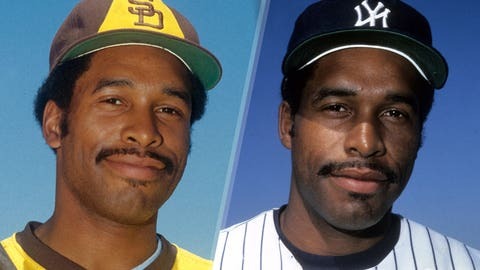 Dave Winfield: Padres or Yankees? 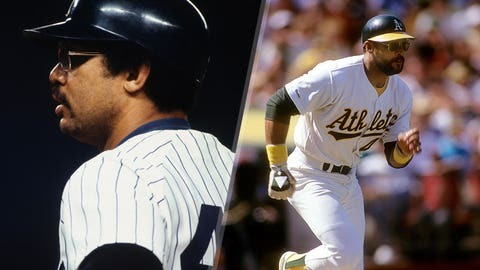 While Winfield developed immensely during his eight years with the Padres, it wasn't until he became a member of the Yankees that he became an RBI machine, driving in 95-plus runs in seven consecutive seasons from 1982 to 1988. In total, Winfield hit 205 home runs and drove in 818 runs during his nine years in New York, well above his offensive production with the Padres. However, Winfield opted to go down in history wearing an "SD" logo atop his head. The speculation as to why he chose to do so is twofold. Winfield, a first-round pick in the 1973 draft, played a major role in helping the Padres settle into MLB as an expansion team formed in 1969. Additionally, his rocky relationship with George Steinbrenner likely didn't make him eager to be associated with the Yankees for eternity.